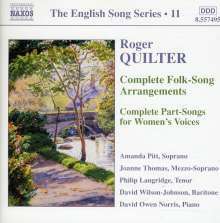 Der Artikel Roger Quilter (1877-1953): Lieder wurde in den Warenkorb gelegt. The Arnold Book of Old Songs (English Songs, Irish Songs, Scottish Songs, French Songs, English & Welsh Songs); The Rose of Tralee; Four Part-Songs for Women's Voices; Three Part-Songs for Women's Voices; 6 Duets; New Discoveries; 3 Songs from "Love at the Inn"
Rooted in the sound of the Victorian drawing-room ballad, Roger Quilter's songs are elegant, refined, often private, always exquisite and without undue embellishment. 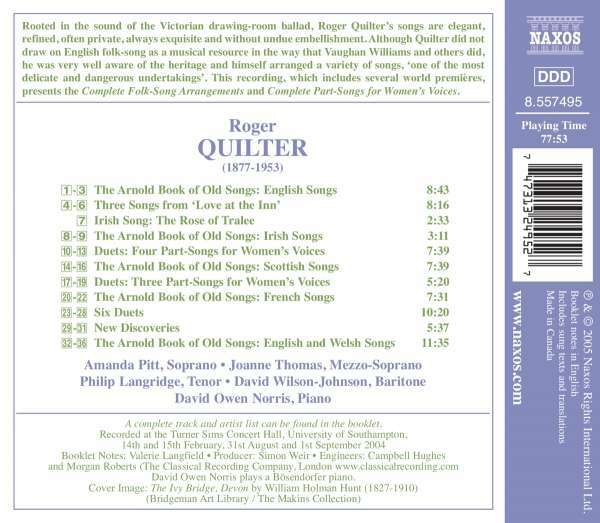 Although Quilter did not draw on English folk-song as a musical resource in the way that Vaughan Williams and others did, he was very well aware of the heritage and himself arranged a variety of songs, 'one of the most delicate and dangerous undertakings'. This recording, which includes several world premières, presents the Complete Folk-Song Arrangements and Complete Part-Songs for Women's Voices. Hörprobe Track 17: 4 Child Songs, Op. 5: Where Go the Boats? 4 Child Songs, Op. 5: Where Go the Boats? Sarah Wegener - ...Into the deepest Sea!